Brrrrr! It sure got cold again! This winter is truly living up to the Farmers Almanac prediction of cold and snowy. However, the cold and snow did not stop us at Waldameer from keeping busy as usual. 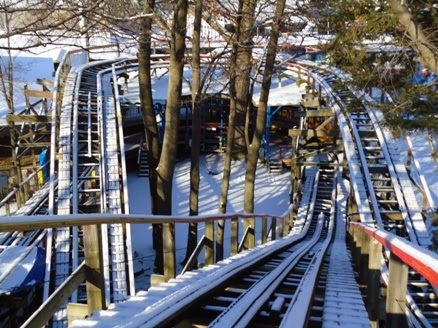 This week, by popular demand, we set out through the entire park to capture what Waldameer looks like during its winter rest. 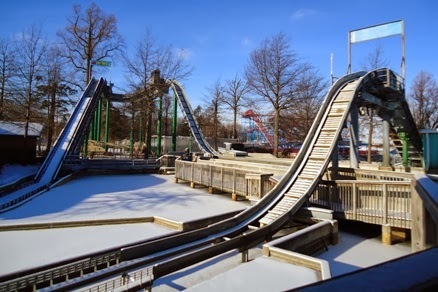 Enjoy your "Winter Walda-land" walk in the park! The Walda-log is lonely without visitors taking pictures each day. I don't think Comet is flying at intergalactic speeds today. Mega Vortex all "huddled up" to keep warm. Not too much fire coming from Steel Dragon right now. Wipeout appears to be missing something. I wonder why"?" The river has frozen over. Ice skating anyone? Polar Vortex with a chance of Big Thundersnow. The louder you scream, the faster May 10th will arrive! 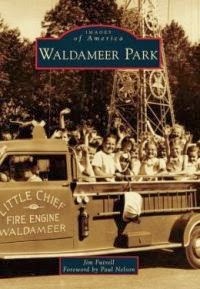 ﻿﻿﻿﻿﻿﻿If you simply can't get enough of Waldameer in the offseason from our Blog, Facebook, and Twitter, you will be excited to know that yet another book was published which features a chapter dedicated to Waldameer. Great Pennsylvania Amusement Parks Road Trip features in-depth interviews with our owner Paul Nelson, and engineers from Gravity Group who designed our award-winning Ravine Flyer II. 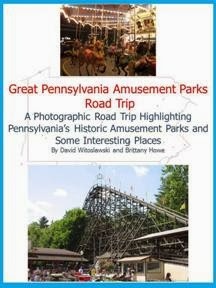 In addition, you find several other pictures and readings exploring all of Waldameer Park as well as many other chapters featuring our Pennsylvania amusement park neighbors. ﻿﻿﻿Don't forget about another Waldameer Book written by a Historian for the National Amusement Park Historical Association, Jim Futrell. You will be fascinated for hours with pictures and passages all the way back from Waldameer's beginnings in 1896 up until the 2013 season. You can find more information and purchase a copy in our Online Store. Before we embark on our next journey, we would like to take the time to thank all of you for being such loyal fans of our re-launched WaldaBlog. Our previous post alone, Mapping Out What's New for 2014, has already had more views than every post in past three years and the second most views of all time. Once again, we cannot thank each and every one of you enough, as this would not be possible without you! 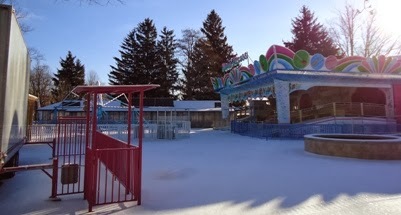 In 2011, 2012, and 2013 Waldameer kept extremely busy opening at least one new ride each season. For the upcoming 2014 season, we took a different approach. We decided it was best to use our offseason to focus on improvements and updates to our existing rides, slides, and attractions. There might not be a new ride or slide for 2014, but we just as busy as ever preparing many exciting new surprises to make your visits with us more fun and family friendly. To keep track of all these new improvements, we will use a park map to check off each attraction that will be undergoing a change for 2014. Red check marks are updates we have already shared, and red question marks are updates and improvements we will be sharing with you in the near future. Make sure you click on the map to get a closer view! Last week we shared our updates for Water World so we checked that off on our map. You might have also noticed there is a second check mark over our XScream drop tower, that's because this week we are proud to share with you a dazzling new twist for this already terrifying ride. 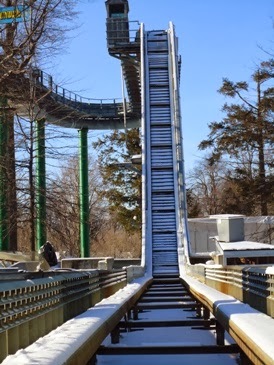 Within a couple weeks of our last day of 2013, our brave maintenance team put on their hard hats, fastened their safety harnesses, and went to work on all 140 feet of XScream. First thing to go was the original orange and green incandescent rope lighting. Then, the entire tower got a fresh coat of white paint. Last, but certainly not least, was the installation of approximately 1,000 feet of awesome new LED lighting. 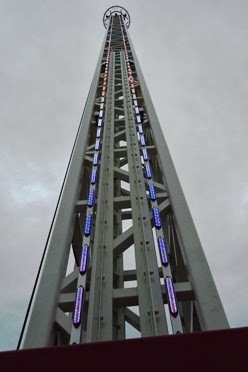 In addition to adding thrills to XScream riders, these new LED lights will entertain everyone in that area of the park. Families taking a break to enjoy some Dippin' Dots, non-riders waiting for others to finish riding XScream or Steel Dragon, and guests waiting in line for Whacky Shack will all be entertained by this incredible lightshow. Most importantly, LED lighting is much more energy efficient than traditional incandescent lighting which not only saves our resources, but is also dramatically more environmentally friendly. XScream looks like a brand new ride with new paint and LED lights! Red, white, and blue are just one of the many effects you will see. Many of our valued Season Pass holders got a chance to preview this new light show firsthand as they came to process their 2014 Season Passes on January 10. In case you weren't able to stop by, here is a little preview of this brand new awe-inspiring lightshow. Time to Start Thinking Warm! What a relief to see that our "polar vortex" of a winter storm gave way to some unseasonably warm temperatures. This brief winter thaw gave us the perfect opportunity to easily explore the park and check on many of our offseason improvement activities. 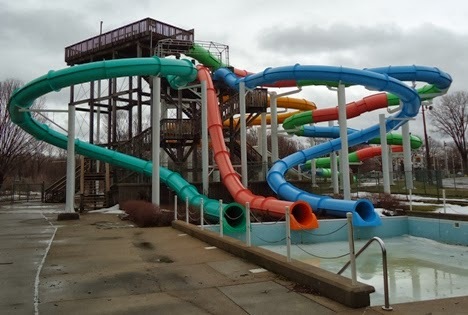 In celebration of this "heat wave," let us begin our exploring in the most popular part of Waldameer on super hot days, Water World. Bermuda Triangle showing off it's new "Bermuda Colors." 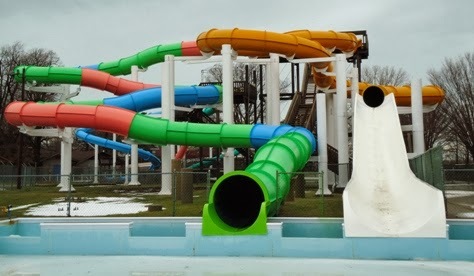 Lake Erie Dip and Presque Isle Plunge are ready to wow sliders with their new smoother and faster slide Surface. Anyone up for a race? Liquid Lightning (right) looks ready to strike next to an awesome assortment of new colors on Awesome Twosome (left). Can you picture all 26,000 square feet of it?